I was naive to think my long weekend was sorted. The original plan was to travel from the Greek island of Chios in Greece to Izmir in Turkey – when British Airways viciously cancelled my flight. Left grounded on a bank holiday, I desperately searched for an alternative sunny destination. The task was easier than one could imagine. Following a momentary glimpse of genius, I found a perfect replacement. It was a very sunny destination indeed. A destination so sunny the sun didn’t set there for the entire summer! You may have guessed it already. I was travelling to Svalbard. 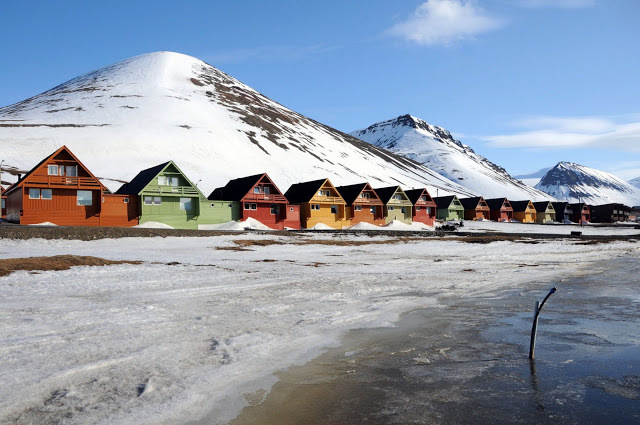 Svalbard is an Arctic archipelago halfway between the northernmost tip of Norway and the North Pole. It comprises all islands between latitudes 74° and 81° North, the principal ones being Spitsbergen, Nordaustlandet, Barentsøya and Edgeøya. 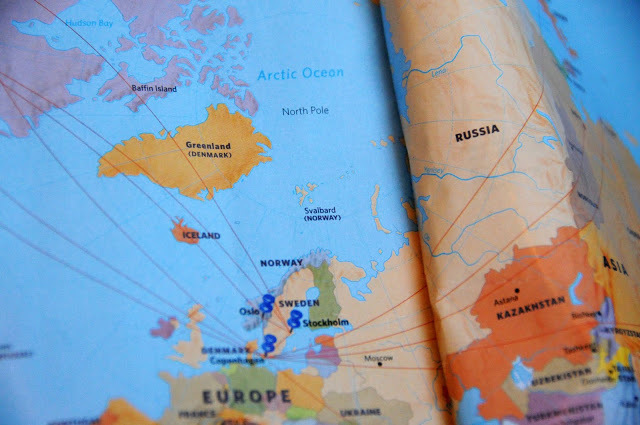 Spitsbergen was the archipelago’s original name under which Svalbard is still best known in the Russian speaking world. Norway holds sovereignty over the islands but with a few restrictions, such as that it cannot deny anyone the right to exploit local natural resources or conduct research. Military activities are out of question; as written in the Svalbard Act of 1925, the archipelago is to remain a fully demilitarised zone. The climate on Svalbard is that of typical Arctic tundra, but thanks to Gulf Stream, is somewhat milder that elsewhere at similar latitudes. Due to the archipelago’s extreme location less than 1,000 km away from the North Pole, the sun doesn’t quite make it over the horizon for four months (mid-October til mid-February). 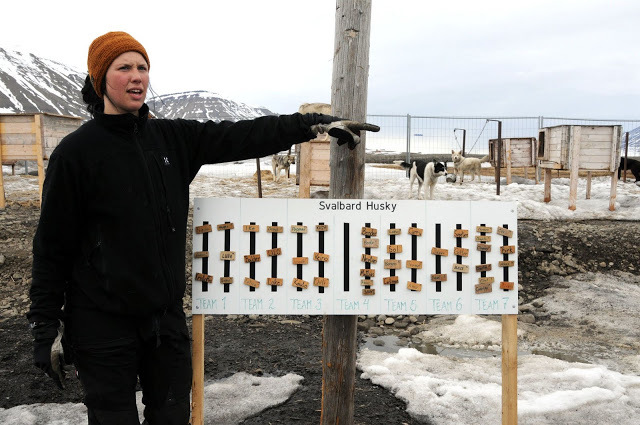 Fortunately, the locals are duly compensated for the lack of light in winter during the summers – midnight sun, or round-the-clock daylight, can be observed on Svalbard from late April til late August. Minus the frequent fog, this indeed makes Svalbard a “sunny” destination – even if in its own special kind of way. I took the preparations for my Svalbard adventure very seriously and soon accumulated a collection of top quality winter gear worthy of any self-respecting Arctic explorer. Feeling good about myself, I duly piled it all into a large backpack and set off on the first leg of my journey – a flight to Oslo. Reading some nameless paper during the flight, I came across an article positively amusing. It told a story of a hapless traveller unlucky enough to lose his luggage on the way somewhere really cold. There he finally stood, in the extreme northern latitudes – in his flip-flops and Bermudas – feeling uncontrolled rage towards his airline and plenty of sympathy for himself. I smiled, put the paper away and thanked the skies for having a whole backpack full of ultra insulated Arctic gear. Which I was also going to use as a cushion for overnighting at Oslo airport before my morning flight to Longyearbyen. Two hours later, I was stretching out on a passenger bench at Gardermoen, with little more than my camera as a surrogate pillow. My luggage – my hypervent, waterproof, ultra thin layer, Northern explorer luggage – was still in London! And of course it would not make it to Oslo in time for my morning flight, meaning that the hapless traveller from the article suddenly turned out to be me. Wearing flimsy canvas shoes and a short-sleeved t-shirt, I was a promising candidate to make a comical sight in Longyearbyen the next day. Where, just for the record, late May temperatures typically averaged at 2-4C degrees. Below zero, of course. I sighed and tried to focus on the positive side; at least SAS wiped away my tears, gave me an overnight bag full of cute mini toiletries and said that 90 per cent of all missing (or “delayed” as they optimistically dubbed it) luggage was found within 36 hours. And there were surely worse things in life than freezing for 36 hours in breathtakingly beautiful Arctic latitudes. All’s well that ends well. 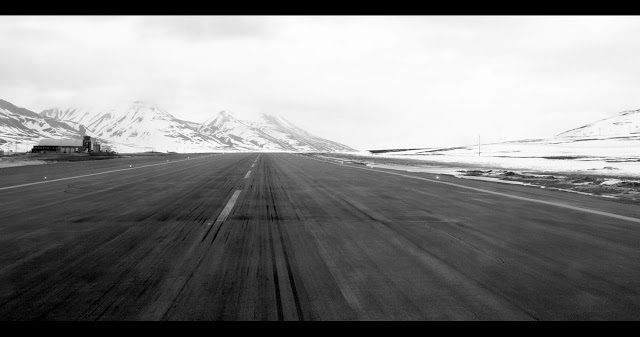 Soon upon landing at Longyear airport – Svalbard’s main gateway to the outside world – I was relieved to hear that my winter stuff had landed at Oslo and was travelling to the archipelago later that night. In the meantime, SAS splashed out on yet another overnight bag (kudos!) and lent me some winter gear from their secret storage room in the airport. They were clearly used to misplacing their passengers’ luggage and covering (or not) the extensive outdoor clothing bills afterwards. Most of the borrowed stuff didn’t fit me perfectly but it kept me warm enough – and hey, beggars certainly can’t be choosers. After sorting out the practical matters, I could at last focus on the surroundings. The flight alone made it evident to the most stubborn of sceptics that we were heading somewhere splendidly unusual. In late May, temperatures in most of Europe were, if not fit for a beach, balmy enough for a decent spring. 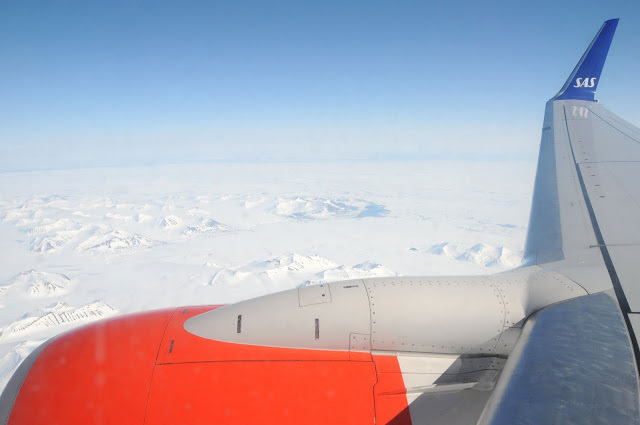 Yet the first sight of Svalbard from our airplane was that of a snow-covered mountain range stretched endlessly towards the horizon. We had flown back into winter; into the place where average summer temperatures barely reached +6C degrees and where the snow only melted – for a short time – in selected coastal areas. The airport, too, had its eccentric side, sporting a single runway and a joint hall for check-in, baggage reclaim, passenger waiting and customer service. I tried to steer my eyes clear of the luggage belt to dampen hard feelings about my famously missing backpack. 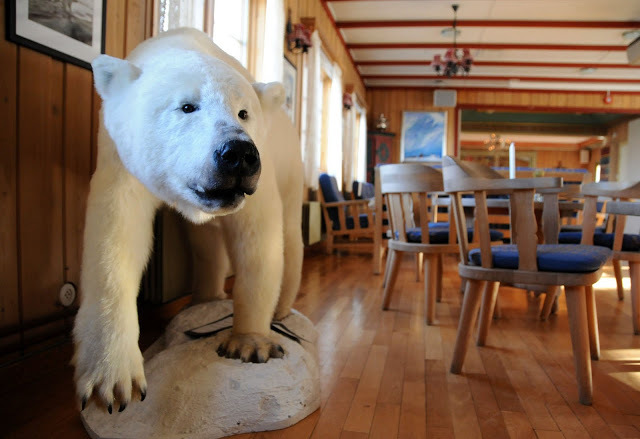 The task was however an ambitious one – for, right there, atop the moving conveyor, stood a life-size stuffed version of a polar bear, Svalbard’s undisputed symbol. With an estimated 3,000 species, the population of polar bears on Svalbard exceeds that of humans – who barely number 2,400. 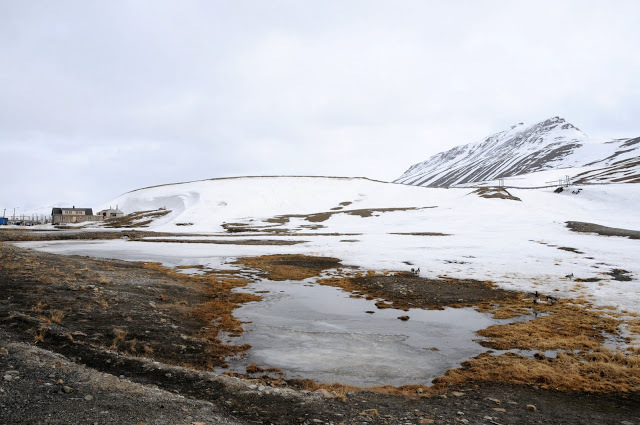 Wet snow was resting on the ground when we reached Longyearbyen. The main settlement lies only 3 km from the airport and is connected to it by a straight coastal road. With the corner of my eye, I noticed a polar bear warning sign at the entry to the inhabited area. 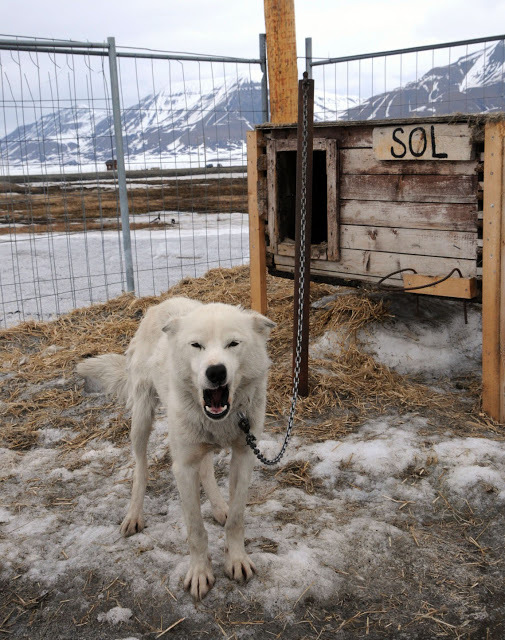 Polar bears on Svalbard have no experience with humans and are likely to see them as a way to survive. 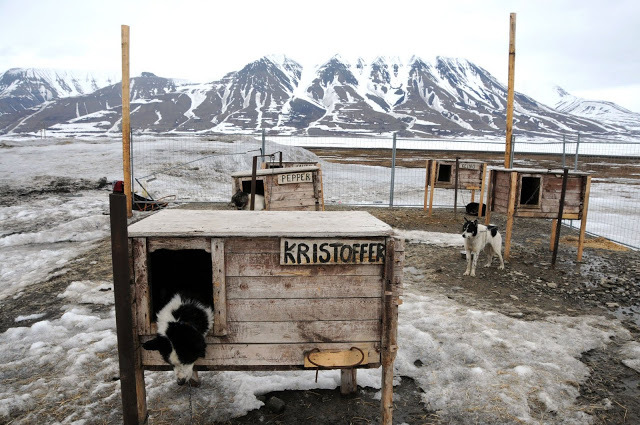 Everyone stepping outside Svalbard’s settlements is required to carry a rifle to protect themselves – as a last resort only – should the polar bear attack. 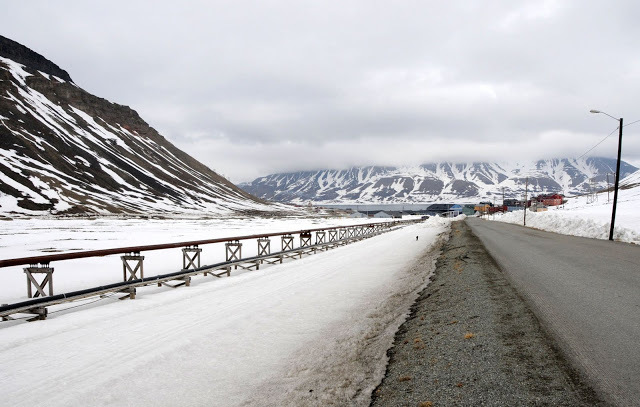 The airport bus (judging by the sign on its side, donated to Svalbard by Trondheim airport authorities) carefully edged along Longyearbyen’s narrow roads as it dropped the passengers off at the town’s few hotels. There are apparently only 50 km or so of roads on the entire 62,000 sq. km archipelago, and the road systems of separate settlements are not interconnected. 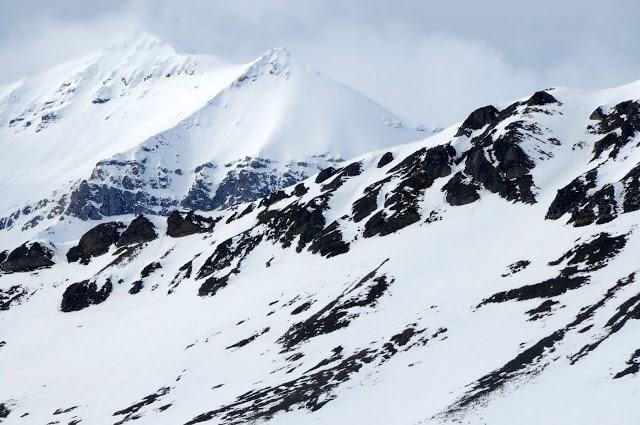 Snowmobiles are used extensively during the winter, providing access to many of Svalbard’s remote areas. When venturing further afield, one can rely on boats and local aircraft, though the latter are generally not available to tourists. 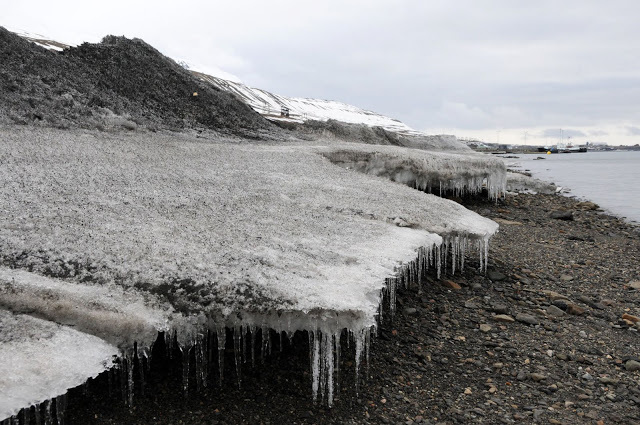 More and more, Svalbard made an impression of an eerily extreme location. My last year’s getaway to Iceland – complete with a live viewing of an erupting volcano and whale-watching in the ocean – was suddenly overshadowed. In front of me was a place incomparably wilder, much more beyond reach and with an even scarcer human presence. After parting with my eye mask the next morning (in the best polar traditions, the sun would not hear of setting) and discovering my backpack neatly parked in the reception (kudos yet again to SAS), I was ready for my first major Svalbard discovery – a boat trip to Esmark glacier and a Russian settlement of Barentsburg. 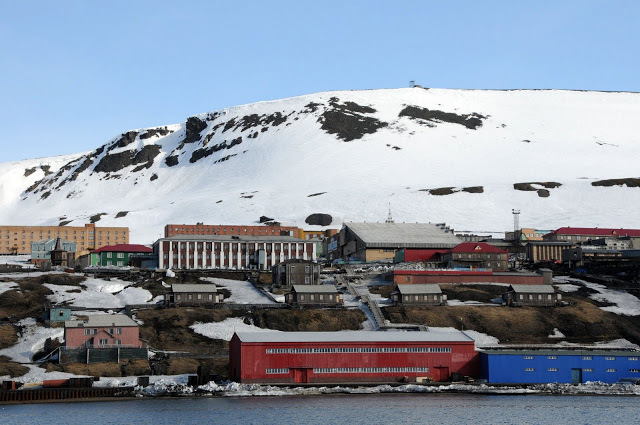 After Longyearbyen, Barentsburg is Svalbard’s largest settlement with some 400 people residing on a semi-permanent basis. 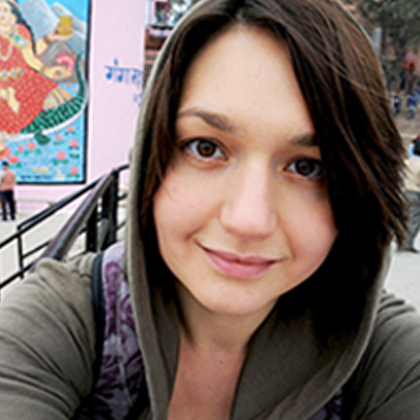 The dwellers are predominantly of Russian and Ukrainian origin, making Barentsburg exclusively Russian speaking. All are employed by the Russian coal-mining company, Arktikugol, which established its presence on the archipelago in the 1930s. But what is a Russian settlement doing on a Norwegian territory, I hear you ask. Behold; while bringing Svalbard under the Norwegian sovereignty, the Spitsbergen Treaty of 1920 also allowed its signatories equal access and exploitation rights of the archipelago’s natural resources. 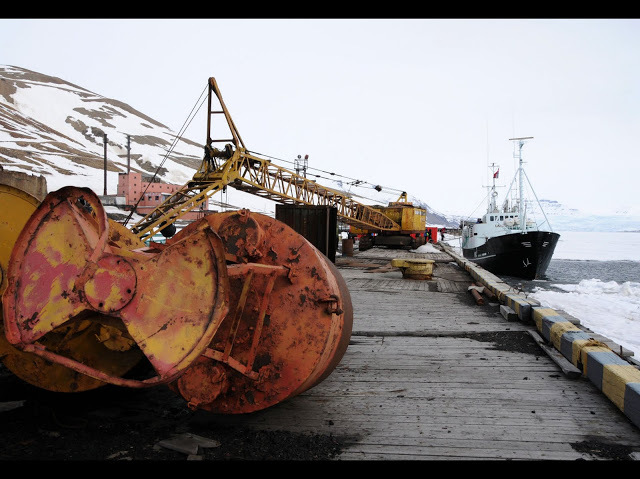 Russia was quick to make use of this clause and its mining activity on Svalbard dates back nearly 80 years. The Russian consulate in Barentsburg even holds the title of the world’s northernmost diplomatic mission. Our guide Vitaly took the long staircase from the harbour to walk us up to the settlement’s “centre”. The place used to be far more lively, he told us, during the Soviet times when it was seen as a channel of communism influence in the Arctic. 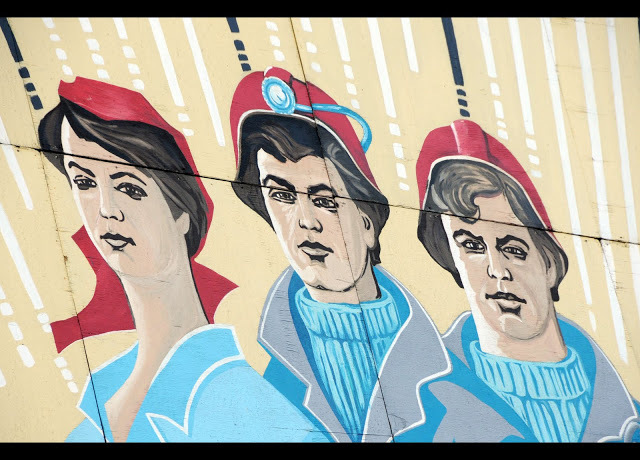 With the Soviet Union’s collapse in the early 1990s, however, the settlement’s population has dwindled from 2,000 a few decades ago. 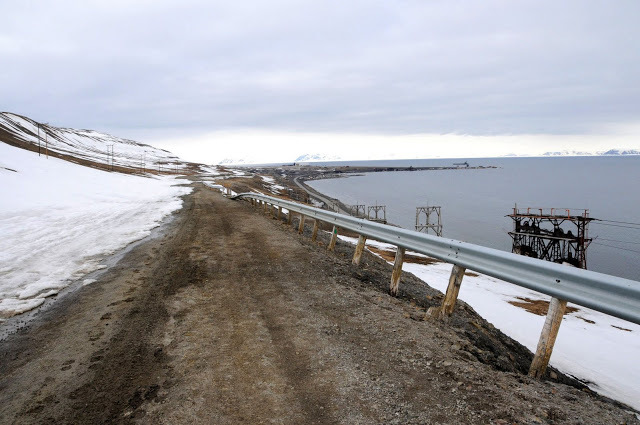 Today, Russia’s presence in the Arctic is more strategic than commercial: Arktikugol’s second settlement on Svalbard, Pyramiden, has been abandoned and close to no coal is currently exported from Barentsburg. 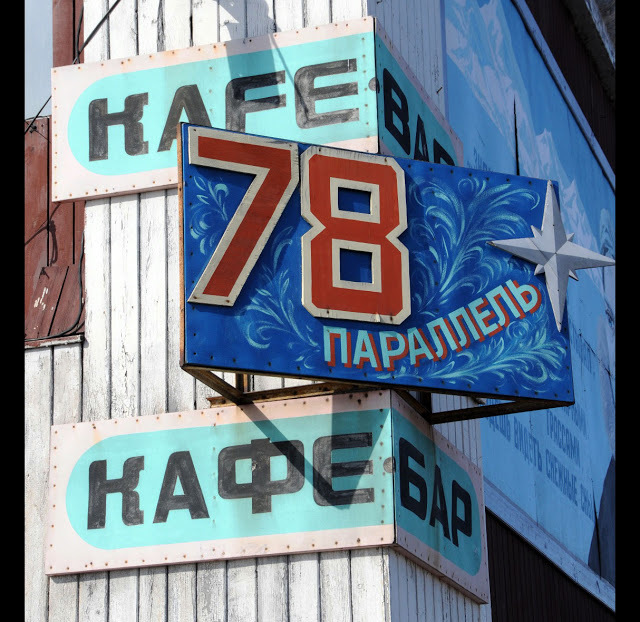 The sight of Barentsburg was like a journey back in time. Most of the buildings in the settlement were built during the 1970s and 1980s and carried a distinct feel of their Soviet legacy. An old-fashioned playground suddenly swirled up a bundle of memories from my Soviet past. 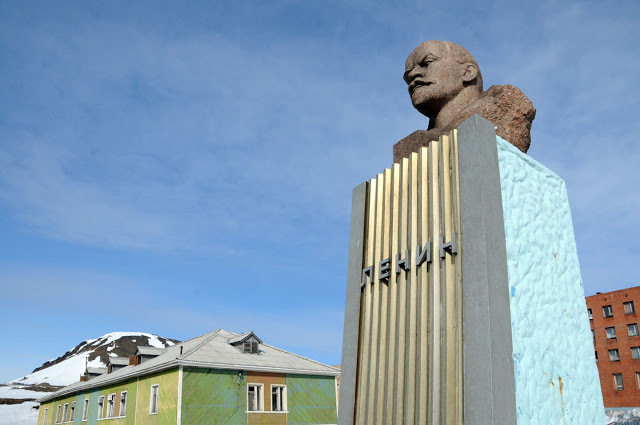 As if to crown it all, a bust of Lenin rose proudly on Barentsburg’s central square. 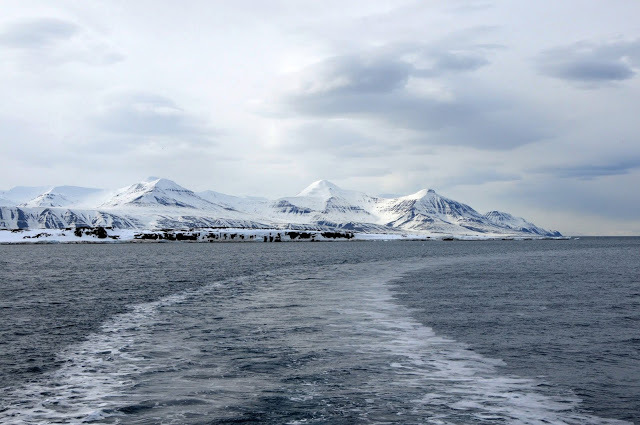 Only the snowy peaks of the surrounding Arctic terrain – coupled with the shiver-inducing sight of the deep blue Isfjorden – gave away the settlement’s extreme location, so very detached from the Russian mainland. Meanwhile, the weather continued brightening up. Blue skies and steep cliffs reflected in the surrounding waters as we sailed past, and myriads of sea birds circled the skies overhead, making a most surreal impression. 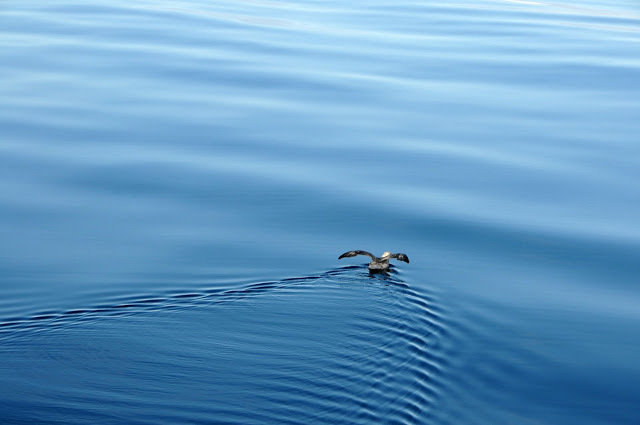 The Barents Sea is among the areas with most seabirds and around 20 million individuals can be found there during late summers. Most of them are migratory birds. Sunshine in Longyearbyen: carpe diem! 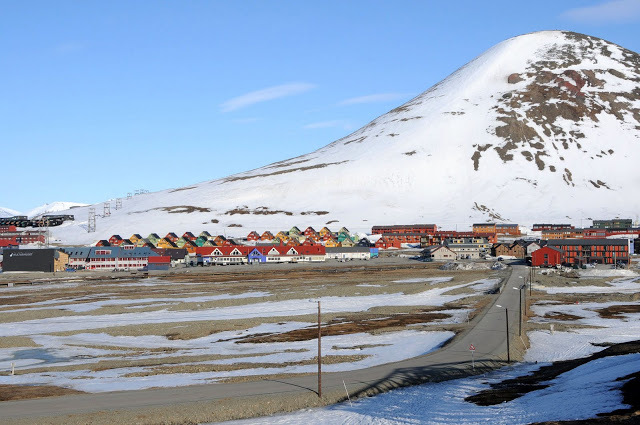 Longyearbyen welcomed us with clear skies; most unusual for late spring in Svalbard. 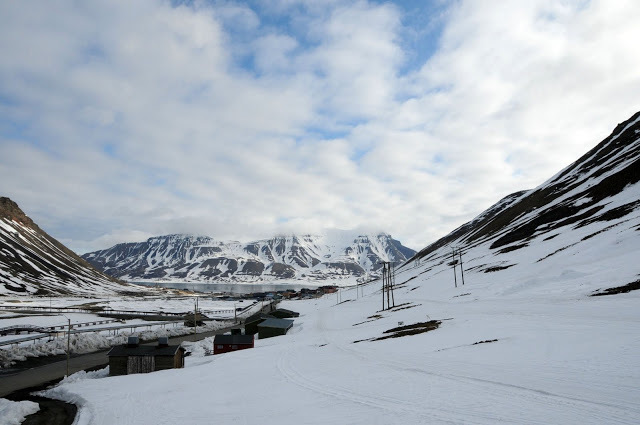 I walked up to the settlement’s main place of worship – Svalbard Church, a cosy building with a small spire – in the so-called “old” part of town, Gamle Longyearbyen. The church, famously holding its doors open at any hour and with a never-depleting supply of coffee and biscuits for visitors, must be the only religious building in the world sporting a stuffed figure of a polar bear by the pews! Remembering my similar encounter at the airport, however, I was no longer surprised. 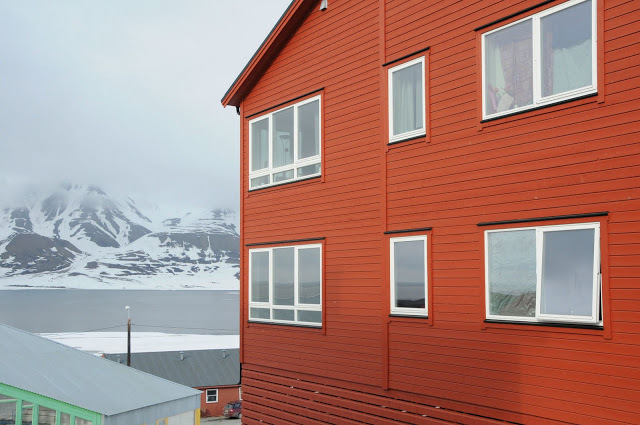 Longyearbyen’s brightly painted houses made a stark contrast with the black and white Arctic backdrop of the surrounding mountains. Each of these buildings has its foundation sitting on wood piles and rises a few extra meters above ground. 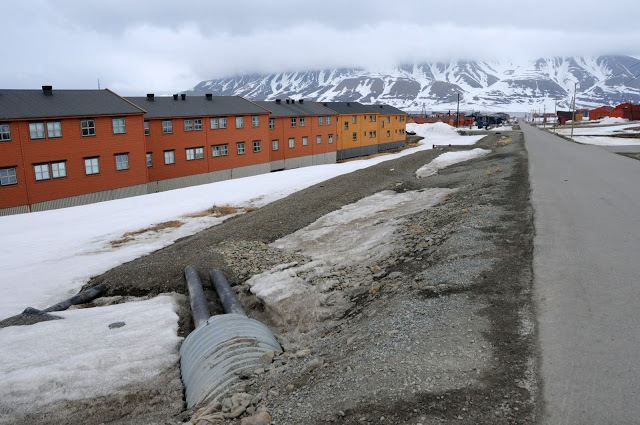 The reason is simple: Svalbard’s soil is continuous permafrost (below or at the water’s freezing point), meaning that the heat of a building adjacent to the ground could thaw it, leaving the building to sink! 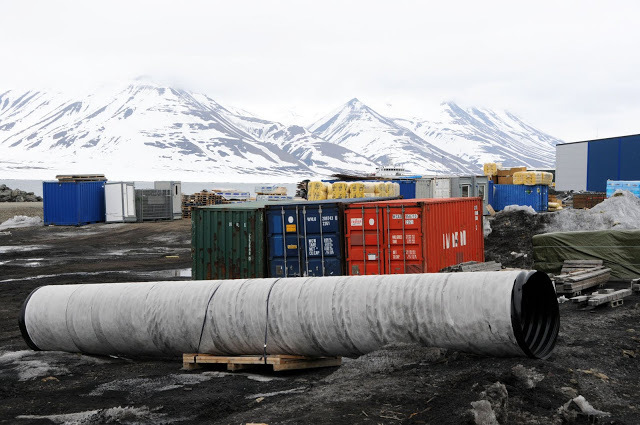 For the same reason, all pipes and cables in Svalbard run overground. 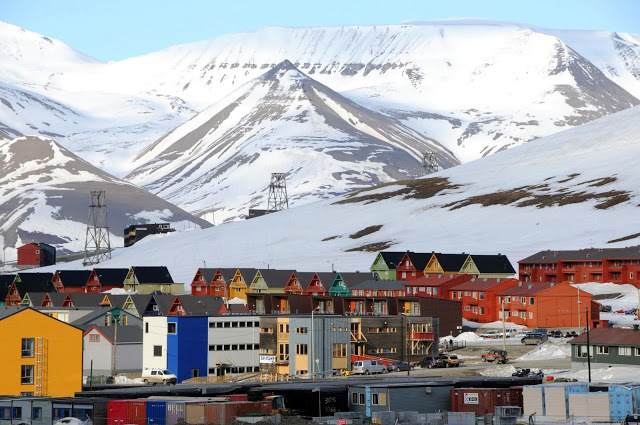 While Longyearbyen certainly isn’t the centre of the world, its infrastructure has been designed to give the population at least some of the mainland’s comforts. I spotted a kindergarten, a school, a swimming pool, a hospital, a sports hall and a community centre. There was a choice of two (!) supermarkets (confirming mainstream economic theories, they were located bang opposite one another), as well as several restaurants, souvenir and outdoor shops. 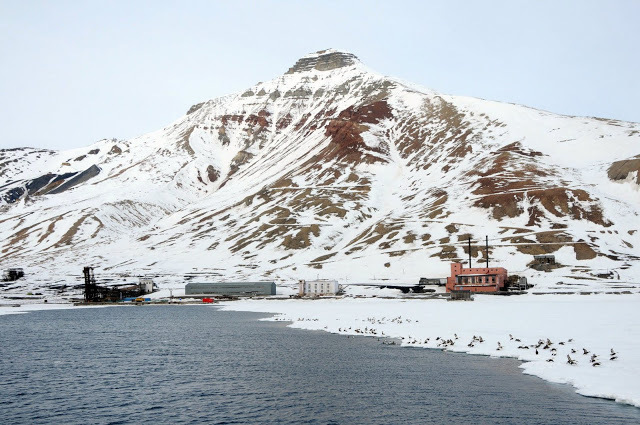 All that aside, Longyearbyen also houses the University Centre in Svalbard (known as UNIS) – the world’s northernmost higher education institution that offers degrees in arctic studies to around 350 students. 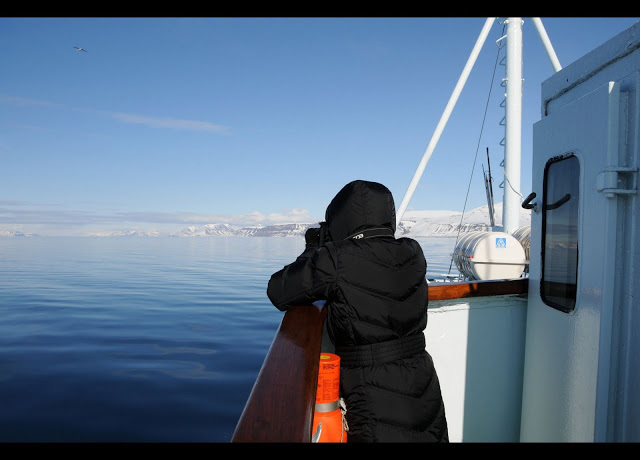 It was in fact the blog of one of UNIS’s researchers residing permanently in Svalbard that got me especially excited about visiting (see Max’s blog and photos here). 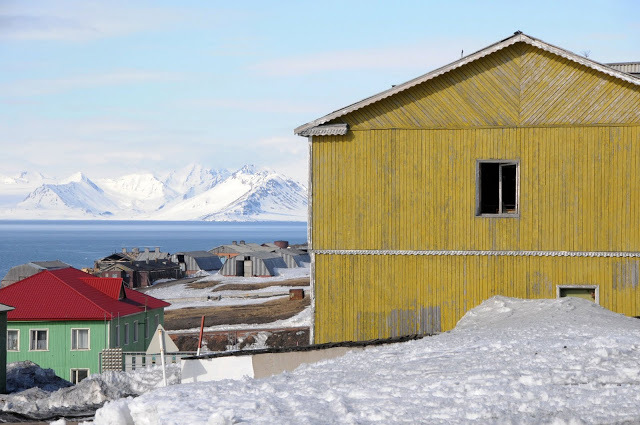 So peaceful was Longyearbyen on this bright spring day – its silence barely interrupted by natural sounds of the birds and the sea – that I suddenly felt I wouldn’t mind staying there longer. Sadly, very few foreigners can afford a long independent stay on the archipelago, as virtually all accommodation is owned by local companies and institutions which rent it out to their staff. And even the cheapest hotel options tend to be pricey. 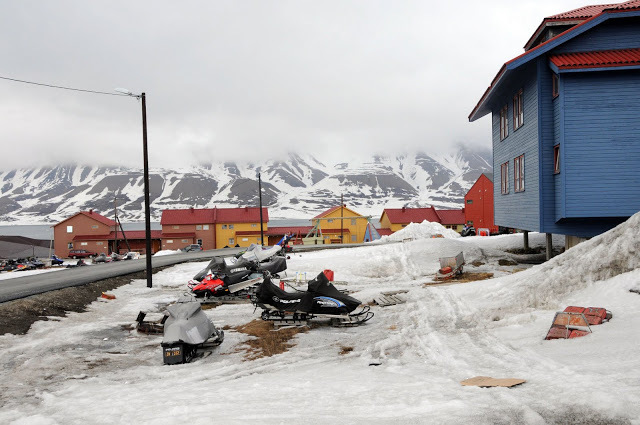 Longyearbyen certainly isn’t a classic backpackers’ destination. 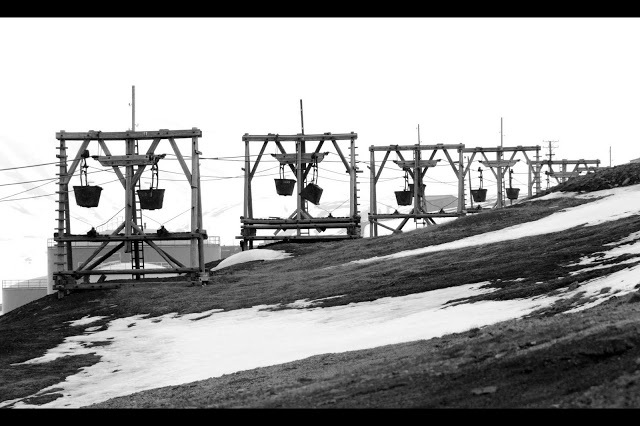 One cannot separate Svalbard from its coal mining past. 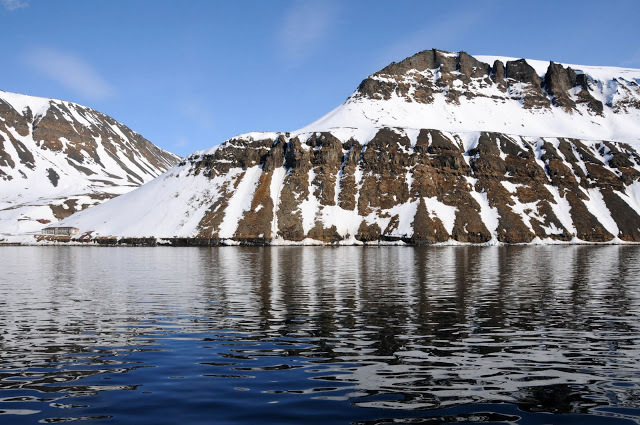 Coal was discovered on the archipelago in the late 19th century, after which Svalbard gained its first permanent community, largely comprised of mining workers. 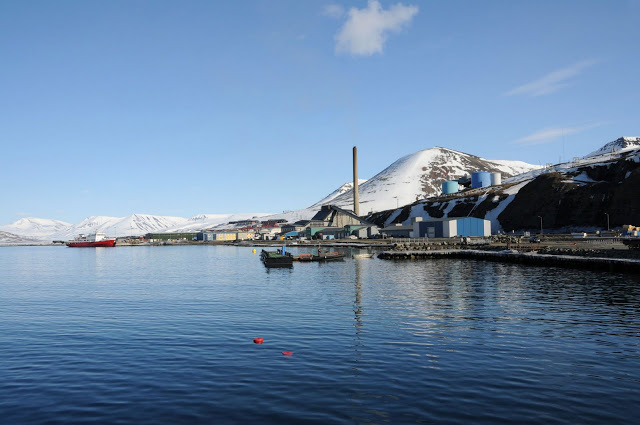 Two coal companies operate on the islands: the Norwegian Store Norske Spitsbergen Kulkompani and the Russian Arktikugol. Store Norske currently exploits two mines. 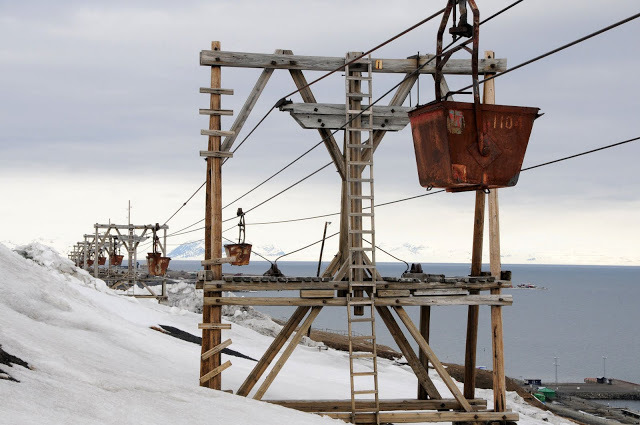 The first one, Svea Nord, is located in Sveagruva, a mining settlement 60 km from Longyearbyen where the workers commute on a shift basis. 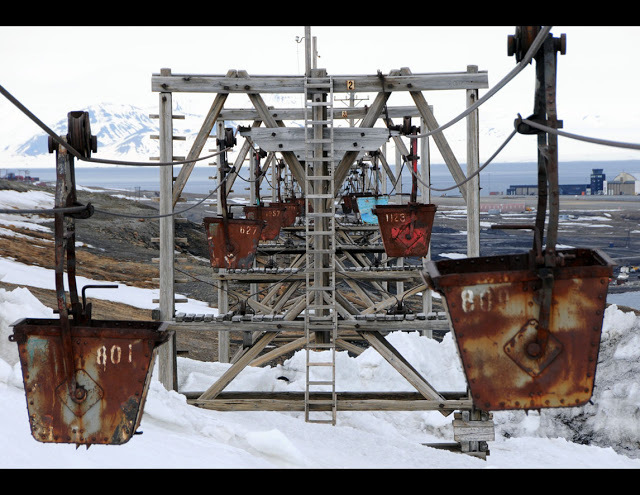 The other mine, simply named Mine 7, supplies coal to fire Longyearbyen’s only power plant. I wanted to pay a visit to the disused Mine 3 before discovering, with disappointment, that guided tours there had been stopped for safety reasons. 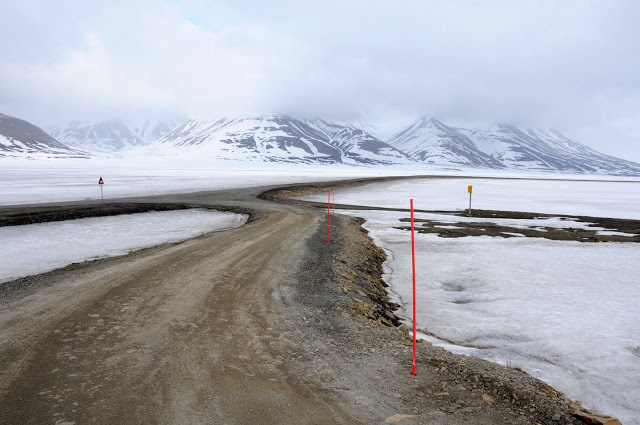 I resorted to talking the walking route between Longyearbyen and Mine 3 instead – the so-called Burma Road. The path ran parallel to the old disused coal cableway. The views towards the airport and across the Isfjorden were nothing short of magnificent. Full of excitement, I climbed several wooden pillars on my way for more interesting shots. It was only at the other end of the path that I realised I should have perhaps not ventured so far outside the settlement without a gun. I hurried back; the return journey was uneventful but I would certainly not recommend anyone to be so forgetful. 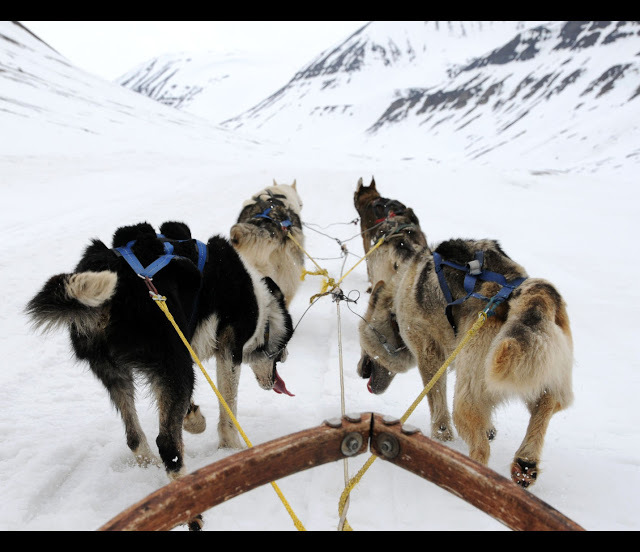 My afternoon was spent experiencing another typical side of Svalbard – a dog-sledding trip in the Adventdalen, a valley a few kilometres east of Longyearbyen. The induction process involved zipping myself into a snowsuit and massive boots permeated inside out with dog smell (as if to remove any doubt about where we were heading), crowning my head with a big furry hat, putting together a puzzle of six dogs and a sled and getting quickly familiarised with the brake system. After which Anna, our Swedish guide, popped that mandatory gun onto her back, and off we went. Huskies were an interesting bunch, strangely impatient to run off to the cold valley with their human cargo and visibly disappointed to be locked up into the snow with a metal “anchor”. 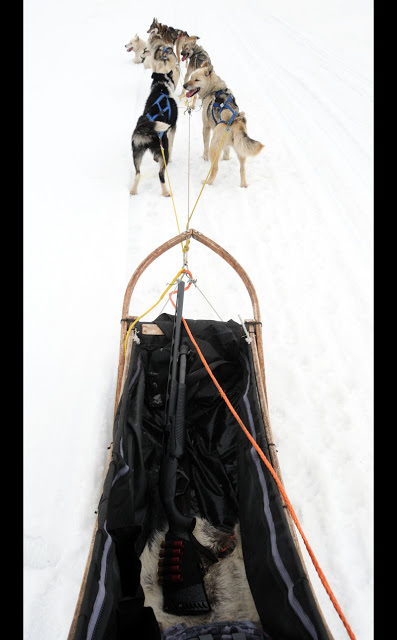 I enjoyed the few hours of riding but could not understand why anyone would want to be sledding on huskies for days – without any comforts of civilisation and for a fee, too! After being swiftly roped in to feeding the dogs upon our return (the food was frozen salmon chopped into pieces with a spade and portioned into big aluminium bowls with an oversized ladle – yum yum), I had had enough of dogs for the day. Needless to say that I still smelt dogs (and their fishy food) while falling asleep that night. 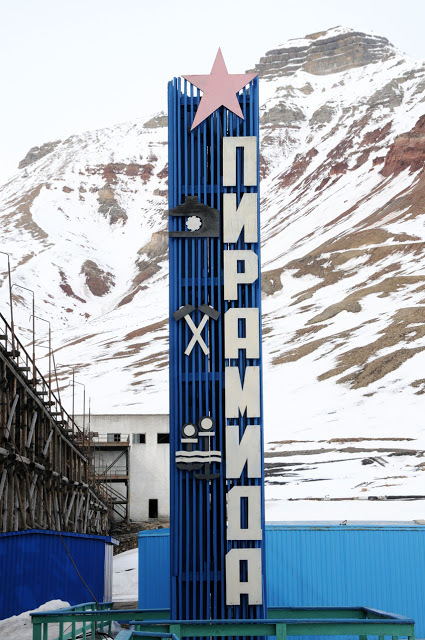 Remember Pyramiden, a Russian settlement that I said had been abandoned over a decade ago? That was the destination of my last day on magnificent Svalbard. The settlement has a bit of a sad history. Back in 1960-80s, it had a promising mining future and used to house over 1,000 residents. However, by the close of the 20th century, coal reserves in Pyramiden turned out overestimated, and the settlement consequently abandoned. 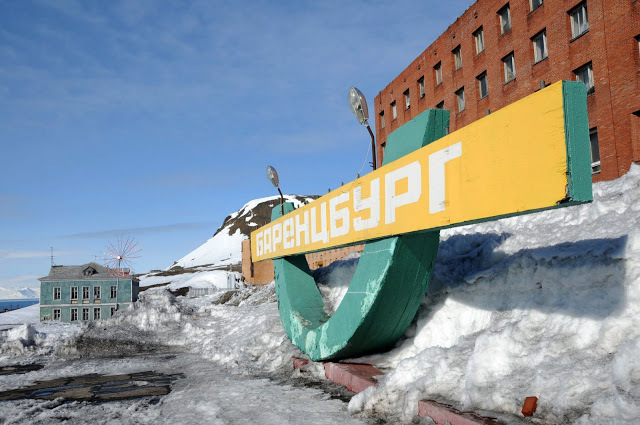 These days, Russian authorities are making attempts to turn Pyramiden into a tourist destination – a summer hotel was even built in 2009 – but the process is slow and the place continues to resemble a ghost town. Pyramiden’s fascinating reputation meant that I was most eager to take pictures there (as you might remember, I particularly enjoy photographing ruins and decay). Stein, the guide of the boat tour, was less enthusiastic. 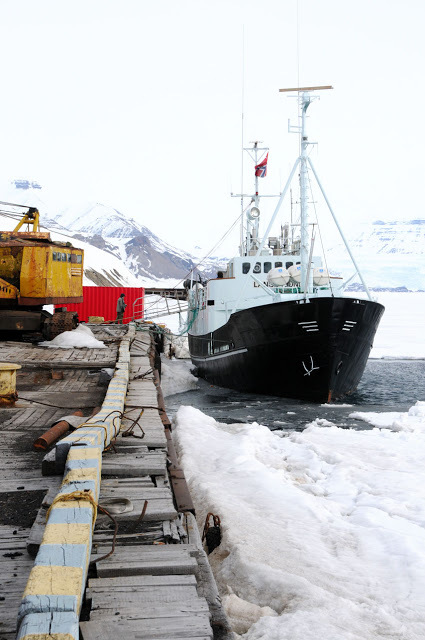 The summer season on Longyearbyen does not fully open till mid-June, and approaching Pyramiden by sea before that is subject entirely to ice conditions. We were most likely not going to make it to the harbour – but the journey itself was promising to be interesting. Let’s just say that we were semi-lucky that day. As if by magic, the ice sheets split bang in front of the Pyramiden harbour to make a narrow passage for our sturdy little boat. We were able to step off and feel solid ground under our feet after a few hours of sailing. The sight of the harbour – complete with a metal skeleton of a loading crane and a faded welcoming sign carrying the settlement’s name in Russian – made a most spooky impression. 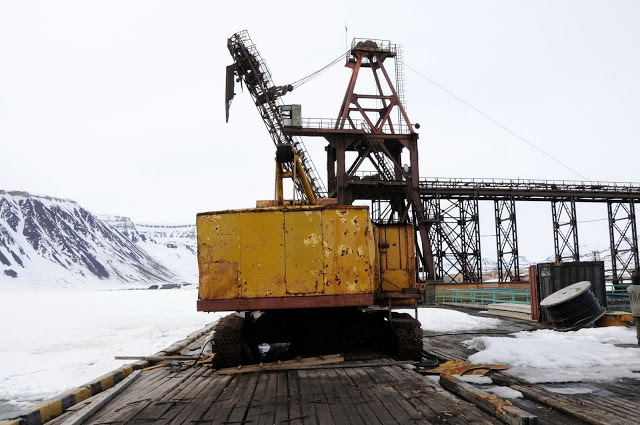 Even more strangely, a fresh looking Russian flag atop the crane stood out eerily as the only streak of bright on the otherwise overcast backdrop of the surrounding Arctic scenery. 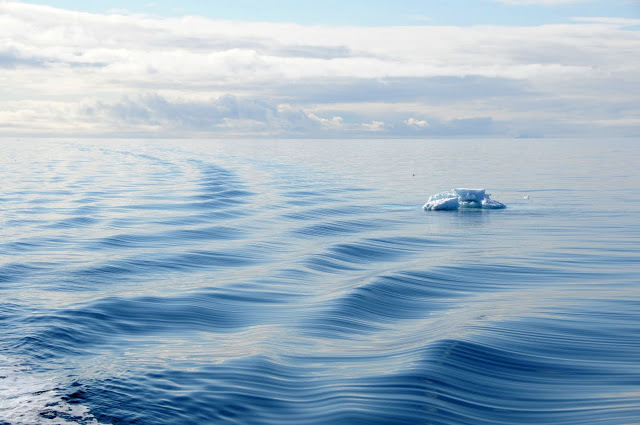 The same ice that gracefully let us pass could easily close back in and make the return to Longyearbyen impossible. We took no risks and left Pyramiden quickly. 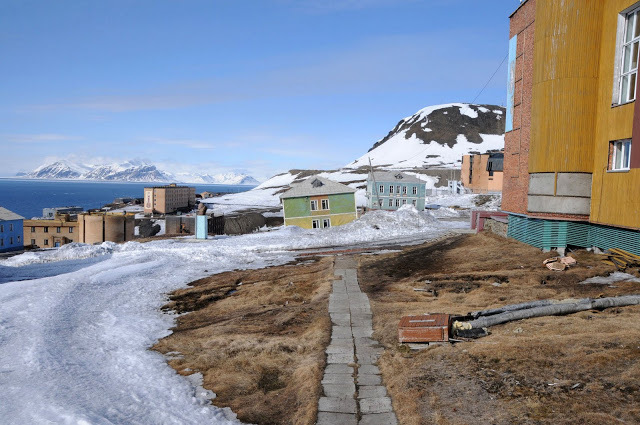 As I watched the tiny settlement getting more and more dwarfed by the pyramid shaped mountain in the foot of which it was sitting – and from which Pyramiden gets its name – I vouched to return one day. And perhaps even greet the four unlucky souls who inject some sort of life into this deserted place. Our return journey was marked by the appearance of a walrus carrying a seal (very graphically, a dead one) which the walrus was obviously intending to have for dinner. The curious animal swam up close to the boat and stared at his sudden audience, not for one moment letting go of his catch. 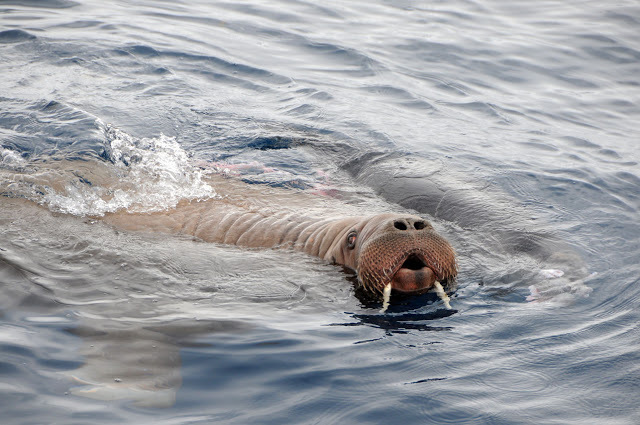 Not even our guide – a native of Svalbard – had seen a walrus devouring a seal before. The final odd moment of the day was hearing the Svenskehuset story. In 1872-73, seventeen people overwintering in an isolated house on Cape Thordsen in Isfjorden died under circumstances most dubious. The cause of their death is now believed to be lead poisoning (I’ll let you read all about it yourselves) but many locals and visitors still believe that the house is cursed. We could see the house from the boat as we sailed past; I took several photos but would most certainly refrain from visiting. The next day brought a snowstorm so strong that not even the sharpest eye could see the other side of the Isfjorden. The “sunny destination” did not turn out to be quite so sunny, after all. Thankfully, it was not the end of the word for the pilot of our SAS airplane. Visibly an Arctic regular, he took a sharp left seconds after taking off, circled over the Isfjorden and pulled up the chassis halfway through the loop – all that to the accompaniment of whistling wind and snow tapping viciously on the windows. It was my life’s scariest flying experience – and, as you might remember, I travel almost every week. Respect to the pilot. Finally the plane evened out over the clouds, and, sipping my tea (the only free item on a typical SAS menu), I reflected on my visit. 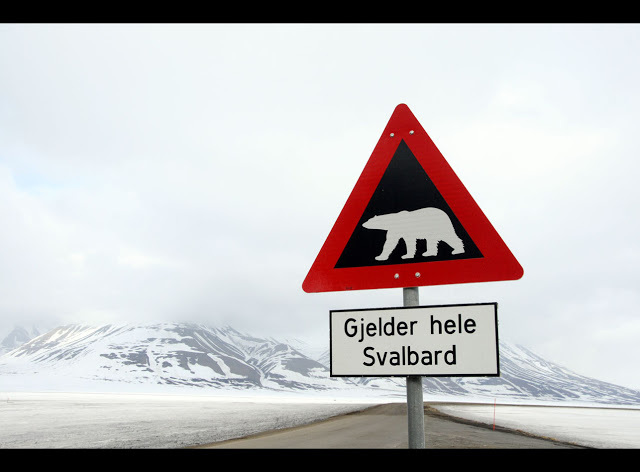 Svalbard is a combination of extremes: the location, the climate, the landscapes, the history, the wildlife and everyday human existence on the archipelago are all off limits for a regular leisure traveller. If you are into balmy temperatures, buzzing nightlife, fine dining and historic architecture, steer well clear of Svalbard. You’d do better in more mainstream destinations. 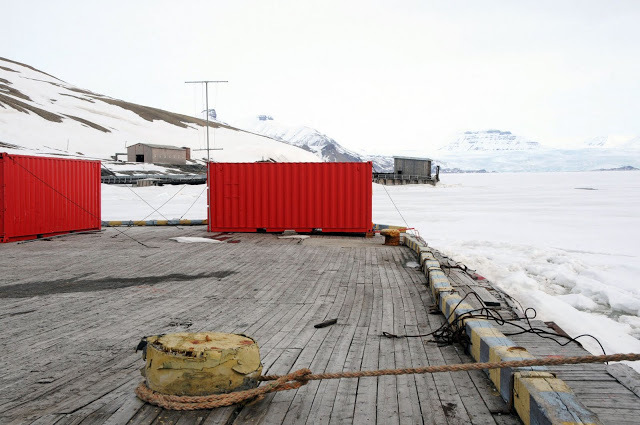 If, however, you are philosophical about the weather, fascinated by unharnessed nature and would like to find out how humans can survive – rather comfortably, too – in climates not really designed for human life – then Svalbard is your place. Polar bears, reindeer, polar foxes and myriads of birds move freely in this fragile Northern environment. 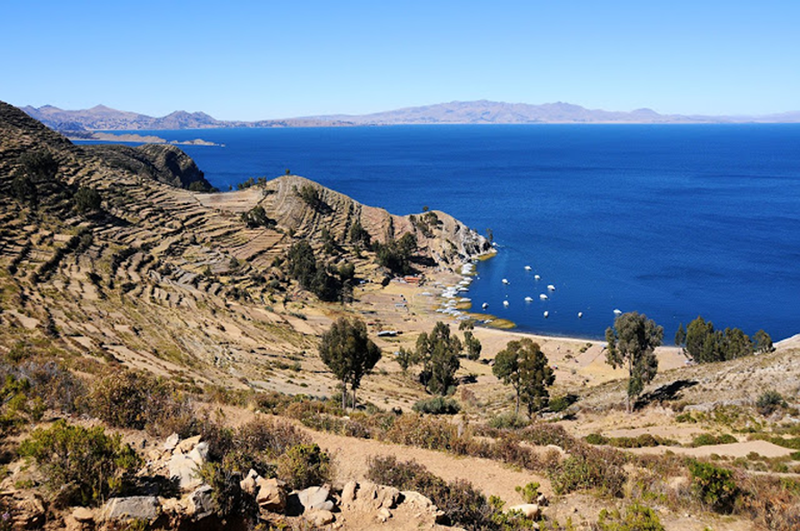 Seven national parks and 23 natural reserves cover two thirds of the archipelago. I have barely seen a fraction of it, and I can hardly wait to come back. And who knows, I might even meet a live polar bear then. See you next year! fantastic adventure! and fantastic photographs! Mr. Inspiration himself! : ) Many thanks, Max – mid-March it is then. nice entry. i would come in mid march. nothing beats the light then. Looks like you had a great time! Really enjoyed reading your article, with fantastic photos!